According to the Student Statistics Office 1,555 international students were enrolled in Winter Semester 2017/2018. During the same period the total number of international students at the University rose from 5,313 in the previous year to 5,433. Duy Linh Nguyen, who hails from Vietnam, is one of those students. In his 5th semester of the BSc program in international geography at Universität Hamburg, Nguyen is currently doing a semester abroad in South Africa. When Duy Linh Nguyen’s professors take attendance at the start of every semester and struggle to pronounce his name, the young man from Vietnam often doesn’t realize they mean him. “It just doesn’t sound like my name. Sometimes I notice that they are about to call me because they suddenly hesitate,” he laughs. Going abroad has always been Linh and his family’s dream. 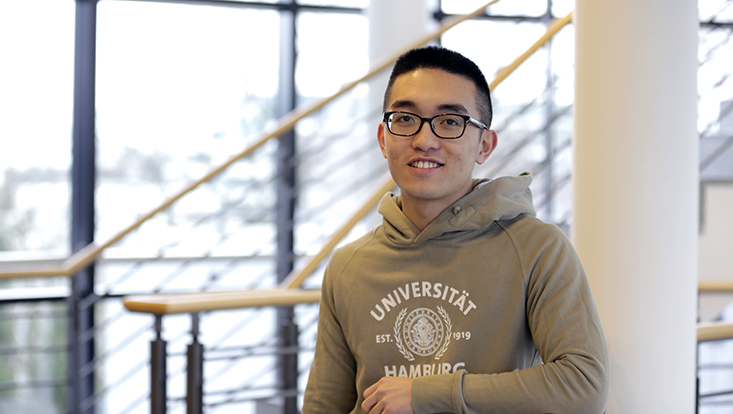 Since studying in England is too expensive, it was clear from the start that Linh would go to Germany. To finance his studies, Linh worked as a student assistant at the CEN school, a graduate school for integrated climate and Earth system research at the Center for Earth System Research and Sustainability (CEN). In his last 3 semesters, he also worked as a tutor, organizing intercultural events for PIASTA, the University’s internationalization program. These take place every Wednesday at 6:30 pm during the semester. These activities perfectly combined Linh’s intercultural skills and climate science interests. Linh flies back to Vietnam for 2 to 4 weeks every year to see his family. “Then I miss Hamburg’s clear, blue skies. In Hanoi the buildings are much taller and the streets are narrower.” His next flight to Vietnam will take off in early 2019. Linh is looking forward to holding his newborn niece. “It’s too bad that I have to miss these emotional family moments,” Linh says with a touch of regret. Thus, he is looking all the more forward to his graduation ceremony in summer 2019, when his parents will visit him in Hamburg for the first time. Not only does Linh miss his family—he misses Vietnamese cuisine. While there are several Vietnamese restaurants in Hamburg, they don’t serve the dishes you would find in Vietnam. Luckily, Linh is open to German cuisine. “If I’m hungry, I even eat green cabbage and sauerkraut!” he laughs. The only thing he can’t get used to is coarse brown German bread. Linh still needs to complete 2 semesters at the Witwatersrand University in South Africa by the end of 2018. Once he completes his bachelor’s degree, he would like to work and become involved in various projects to gain more experience. Only then will he decide whether or not to pursue a master’s degree. He is still open to seeing other countries along the way. One thing he is sure about, however, is that he ultimately wants to go back to Vietnam. “My goal is to bring the best from highly developed countries back to Vietnam. I know how things work there and there is still much to be done."